HOUSTON, Texas, March 8, 2011 (ENS) – Three nonprofit groups Monday filed a federal lawsuit aimed at cleaning up air pollution from the Lower Colorado River Authority’s coal-fired Fayette Power Project located between Austin and Houston. The Lower Colorado River Authority’s Fayette Power Project facility consists of three coal-fired boilers, designated as Units 1, 2, and 3, and associated facilities and material handling. 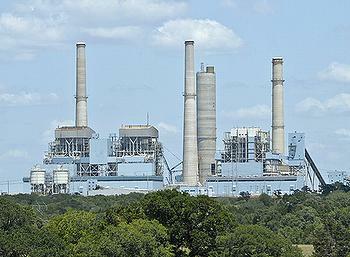 Units 1 and 2, jointly owned by LCRA and the City of Austin, each have an electric generation capacity of 600 megawatts. Unit 3 is owned solely by LCRA and has an electric generation capacity of 450 megawatts. “LCRA is slowly making some progress to reduce sulfur dioxide emissions, and we’re asking LCRA to pay attention to the other dangerous air contaminants it emits from its smokestacks,” said Levin. The groups’ lawsuit claims that LCRA’s Fayette power plant is violating the New Source Review provisions of the Clean Air Act by increasing generating capacity without making the pollution control upgrades required when new sources of power come online. The groups claim that LCRA made “major modifications to the power plant’s main coal-fired boiler units” but failed to obtain necessary permits, install best available control technology, reduce emissions, and comply with requirements for monitoring, record-keeping and reporting under the law’s New Source Review provisions. When a coal-fired power plant generates more power without installing pollution control upgrades, it emits greater levels of fine particle pollution into the air. Particulate matter is a mixture of small particles, including organic chemicals, metals, and ash, which can cause health and environmental problems. Fine particles with a diameter of ten micrometers or less, PM10, about one-seventh the diameter of human hair, are regulated by the U.S. Environmental Protection Agency. So small they can be detected only with an electron microscope, once inhaled into the lower respiratory tract, these fine particles can affect the heart and lungs and cause serious health effects, the EPA states, and the groups explain in their legal filings. “Numerous scientific studies have linked fine particle exposure to increased respiratory symptoms, such as decreased lung function, aggravated asthma, chronic bronchitis, heart attacks, and premature death in people with heart or lung disease,” the lawsuit states. In addition, the groups claim the fine particles travel far from the Fayette plant to settle over land or water, polluting lakes and streams and damaging farmlands. Tom Mason, general manager of the Lower Colorado River Authority, said Monday that the Austin-based public utility organization will “vigorously defend” allegations by the environmental groups claiming violations of the Clean Air Act at the Fayette Power Project. When the plant’s permit was issued in 2002, LCRA and the City of Austin agreed to add scrubbers to reduce emissions. Mason says the $400 million worth of additions are projected to remove about 95 percent of sulfur dioxide emissions, about 20 to 25 percent of mercury emissions, and lead to significant reductions in particulate matter emissions from FPP units 1 and 2. The scrubber on unit 1 began operating in January. The scrubber on unit 2 will begin operating later this month. A scrubber was built into unit 3 as part of its initial construction. Unit 3 has been generating electricity since 1988. “It is ironic that these allegations come just as LCRA and our partner, the City of Austin, complete construction of a $400 million project that will further reduce emissions from the Fayette Power Project,” Mason said. But the groups’ lawsuit alleges tens of thousands of violations of air pollution limits found in the power plant’s air pollution permits. The groups claim that LCRA violated and continues to violate heat input limits that have always been enforceable conditions of the power plant’s air pollution permits. The groups also claim that LCRA deprived the state of Texas more than $500,000 in annual air pollution fees that are used to pay for the cost of clean air programs, by under-reporting the amount of particulate matter that is emitted into the air from the plant’s smokestacks in annual reports filed with the Texas Commission on Environmental Quality.